The DragonFly Red uses the highest quality DAC (Digital to Analogue Convertor) ever used in a DragonFly, giving true audiophile sound quality. The 32-bit ESS 9016 chip is more usually found in high-end hi-fi equipment and boasts an astonishing signal to noise ratio, making it sound more precise and detailed than the DragonFly Black. Rather than using the Black's analogue volume control, it also deploys bit-perfect, digital volume. This reduces distortion still further, delivering an 'inky' black silence when the music demands. With lower power consumption than previous DragonFlys, the DragonFly Red is suitable for use with smartphones and tablets without undue battery use. 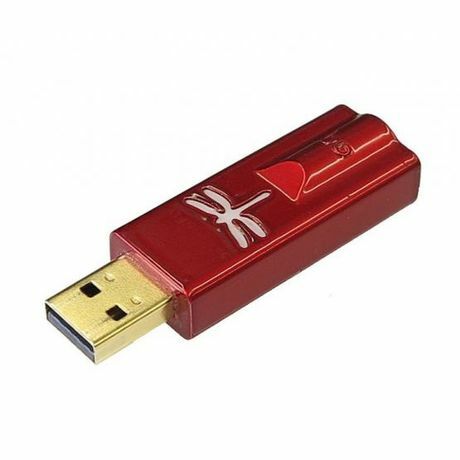 Simply fit a USB adaptor to suit your device and connect up to an Apple or Android smartphone or tablet for a massive improvement in sound quality. With a boost in output from 1.2V to 2.1V, the Red is far better at driving difficult headphones than the Black version. If you use larger headphones, with more powerful magnets, such as the Grado range or AudioQuest's own Nighthawks, then the Red model is ideal. The higher output gives effortless dynamics, a powerful bass and ability to make the music 'come to life'. Although tiny, the DragonFly is every bit as impressive as many full-size DACs. Asynchronous transfer and twin clocks ensure perfectly timed and controlled digital information enters the DAC, for a highly accurate and precise sound quality. Compared to a computer/smartphone/tablet's headphone output you'll notice a more dynamic sound with more detail and openness. In essence, the sound will simply be more life-like. Whether you listen to music on your smartphone, tablet, Mac, PC or laptop, the audio quality can easily be improved. Whether you use headphones or have your device connected directly to your hi-fi, the DragonFly Red simply gives a huge improvement in sound quality. It bypasses the device's built-in DAC, instead passing sound through its own, high-end hi-fi quality chip. Despite its tiny size, the DragonFly will play a wide variety of music files. Twin clocks ensure perfect playback of 44.1 kHz (CD quality), 48 kHz, 88.2 kHz and 96 kHz. As a final neat touch, the DragonFly logo glows various colours to indicate the file frequency: green for CD (44.1 kHz), blue for 48 kHz, amber for 88.2 kHz and magenta for 96 kHz. Use pretty much any headphones on almost any device and experience your music to its full potential - the DragonFly Red meets the highest expectations.